Do you need extra help for EL students? Try the Text Features Evaluation pre-lesson. Students will be able to compare and contrast two nonfiction references on the same topic by reviewing their text features. Hand index cards to each student and pair them as A and B partners. Assign the A partners to draw a pen and B partners to draw a pencil. Collect all the cards and redistribute them. Have your students compare and contrast features of the items and share their thoughts with an elbow partner. Call on students to share what they said or heard to the whole class. Explain that although the items are of the same type, they have different designs and may be better suited for different uses. Likewise, today’s lesson compares nonfiction books on the same topic, by their text features. Nonfiction text features are distinctive traits commonly found in nonfiction texts. Provide visual vocabulary cards of different text features for a visual representation of the Nonfiction Text Features Checklist worksheet. Allow ELs to use their home language (L1) or their new language (L2) to restate the definition of text features. Use a real-life pen and pencil and ask ELs to share the similarities and differences between the pencil and pen aloud. Pay attention to their language to gather background knowledge on their use of academic vocabulary. Demonstrate a gallery walk (a preview by flipping through and noting distinctive features) through a pair of nonfiction books on a shared topic for your class. 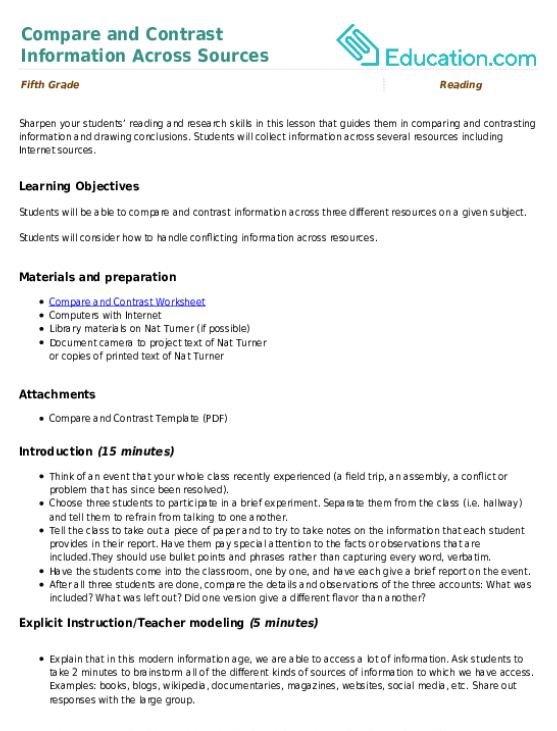 Display and complete the Nonfiction Text Features Checklist in front of your students using the nonfiction book pair. Comment on the effectiveness of features and how they are used when encountered. Give ELs a copy of the teacher copy of the nonfiction pairs text and allow them to label the text features with pre-cut text feature labels. Ask ELs to use their L1 or L2 to explain their labels. Allow ELs to share their ideas with their partners before giving input to the teacher regarding text feature labels. Guide your class through another preview of a nonfiction book pair on a shared topic (i.e., examine a textbook decades old and a new text like Kids Discover). Have them brainstorm aspects of the two texts that make one text better than the other (e.g., color, quality of the pictures, amount of text features on a page, etc.). Hand out and complete one side of a class set of double-sided Nonfiction Text Features Checklists on the book pair with your students. Make sure ELs know the meanings of the text features on the checklist. Provide visual vocabulary cards with difficult text features. Ask ELs to tell in their L1 or L2 which nonfiction text is better, or which text they prefer over the other, and why. Provide sentence starters as support if necessary. Have your students flip and complete their Nonfiction Text Features Checklists using a pair of nonfiction texts on the same topic. Pair students with sympathetic partners that can assist ELs with reading the texts. Allow ELs to read the text after their partners. Provide visuals of key vocabulary as necessary. Allow ELs to use a glossary in their L1 or L2 to help them find the meaning of content-specific words. Print out one to two page preselected leveled nonfiction text excerpts for students to compare. This also alleviates the need for a full class set of common topic book pairs. Make multiple copies of three to four pairs of nonfiction text selections and place them at tables as stations for students to go to as centers. 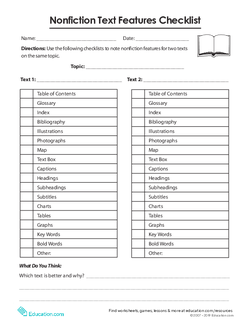 Download and print single sheet leveled pairs of nonfiction text on common topics for students to evaluate. Coordinate this lesson with a librarian and plan to teach this after the library visit where students can self-select texts on topics of their choice and reading level. Students can expand their response to the "What Do You Think" question with: Who, What, Where, When, Why, and How comparison details. Students can write an opinion piece that describes an ultimate third supplementary book for their text pair. Using tablet or laptop cart, students can compare two different nonfiction internet sites on a shared topic to evaluate. Show students a page from two separate nonfiction texts, each containing two or more nonfiction features. Exit ticket: on a piece of scratch paper, have your class write which text is better and why. Review for student understanding. Give ELs phrases or sentence frames to help them write about which nonfiction text is better. Allow them to justify their choice in their L1 first. Challenge them to use their L2 after their first explanation. Allow them to use their vocabulary cards in their explanations. "The ____ is better than ____ because ____." Encourage them to use the names of specific text features in their explanations. Discuss: What perspectives, voices, and representations are missing from nonfiction texts compared in today’s lesson? Define the following words to ELs: representations, perspective, and voices. Simplify the question by asking some of the following questions: "Who wrote the text? Whose ideas are in the text? Did the author give another idea that challenged the first idea?" Allow ELs to share in their L1 or L2 before they share with the whole class. Challenge them to refer to some of the text features in their discussion. Not all nonfiction texts on the same topic are created equal! Using this lesson plan, your class will become familiar with nonfiction features by comparing and contrasting texts on a shared topic. This resource goes along with the Comparing Nonfiction Text Features lesson plan. When students read nonfiction texts, they will need to make inferences using text features and quotes as evidence. Scaffolds will help your students answer text-dependent questions. 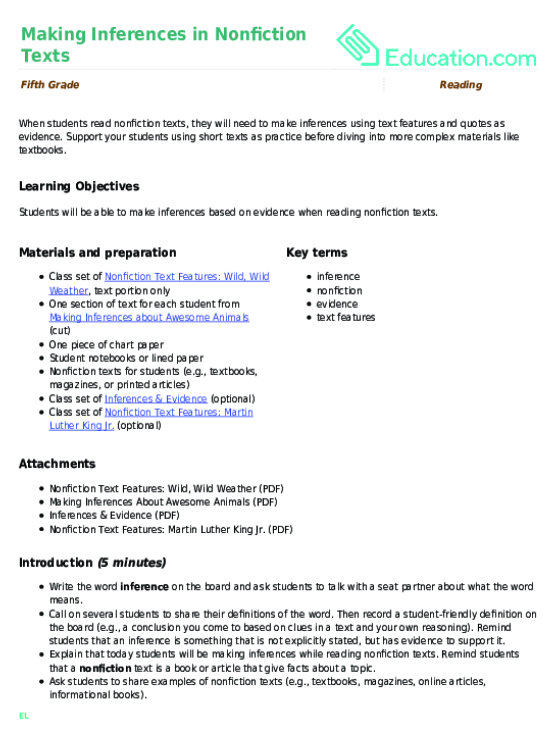 This lesson can be paired with the lesson Informational Text: Close Reading. Sharpen your students’ reading and research skills in this lesson that guides them in comparing and contrasting information and drawing conclusions.